Theranos founder Elizabeth Holmes is having a hard year. After a Wall Street Journal report exposed her company’s innovative blood tests as faulty last October, the once beloved CEO—who proudly dons a black turtleneck like her idol Steve Jobs—has been banned from operating a lab for two years, lost her fortune, and faces multiple lawsuits. But before it all came crashing down, Holmes herself was an inspirational speaker, a beacon of hope for women trying to make it in tech. 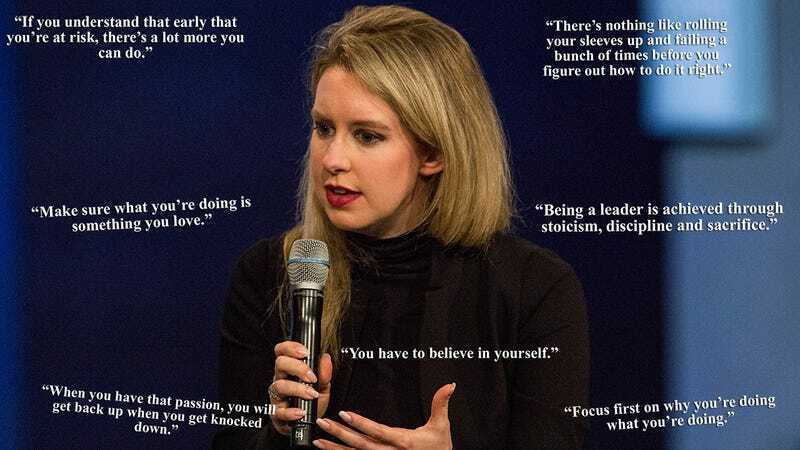 She dropped out of Stanford to found Theranos at 19, becoming the world’s youngest billionaire at 31. Now more than ever, Holmes should take some of her own advice. We went digging to find some of her best nuggets of wisdom from before the collapse of her company. You’re welcome. Elizabeth, your former self believes you can still prevail. Now you just have to prove that to the rest of the world.